Articles for category "Education and Outreach"
A coordination meeting of the Gender Gap Project took place on 18 and 19 February 2019 in Berlin at the Einstein Center Digital Future. The partners presented the results of the different tasks and prepare The International Conference that will be held from 4th to 8th November 2019 at ICTP Trieste. 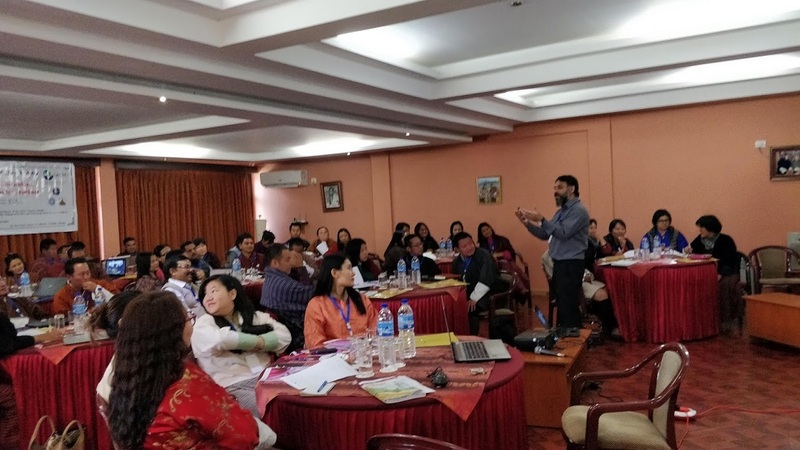 The TROP ICSU team conducted a workshop for teachers at Bhutan on 14th-15th February 2019, in collaboration with Center for Disaster Risk Reduction and Community Development Studies (CDRR&CDS), Royal University of Bhutan, Rinchending, Bhutan and Commission on Education and Outreach, IASPEI. Over 60 high school and undergraduate colleges/university teachers from Bhutan participated in this workshop. ACT is a H2020 project for supporting “Communities of PrACTice for Accelerating Gender Equality and Institutional Change in Research and Innovation across Europe” running from 2018 to 2021. We have prepared a short feedback channel for interested practitioners, academics and experts to form part of the ACT Communities of Practice. IUBS is one of the partners for a global project on "Gender Gap in Science : A Global Approach to the Gender Gap in Mathematical, Computing, and Natural Sciences: How to Measure It, How to Reduce It?" IUBS is the Lead Partner and Implementation Agency for a global project on Climate Change Education - "TROP ICSU"
TROP ICSU (Transdiciplinary Research-Oriented Pedagogy for Improving Climate Studies and Understanding) is a global project funded by the International Council of Science to improve awareness of climate change and the science behind it on high school and undergraduate levels of education. Together with the International Union for Quaternary Science (INQUA) IUBS is the leading scientific organisation in this project funded by the International Council for Science (ICSU). The project develops detailed educational resources available to teachers, that bring climate-related examples and case studies to the core curriculum, and enhance conceptual understanding of the topics in basic science, mathematics and other disciplines. The TROP ICSU team will conduct a workshop for teachers at Kampala, Uganda, in November 2018 with enthusiastic and valuable support from our partner, the African Union of Conservationists (AUC). The first TROP ICSU workshop for teachers was held in collaboration with Sri Venkateswara College (University of Delhi), New Delhi, India, on October 13 and 14, 2018. 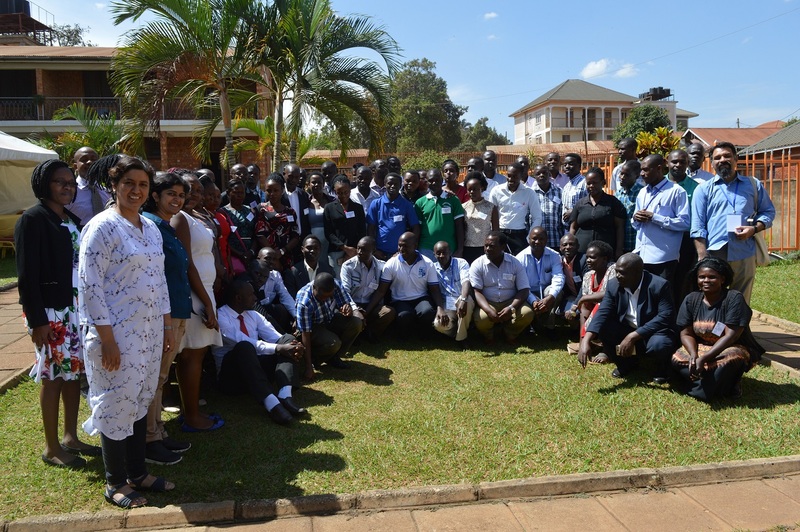 The TROP ICSU team conducted a workshop for teachers at Kampala, Uganda, in November 2018 with enthusiastic and valuable support from one of the partners, the African Union of Conservationists (AUC). Over 60 high school teachers and over 70 university teachers participated in the workshop. 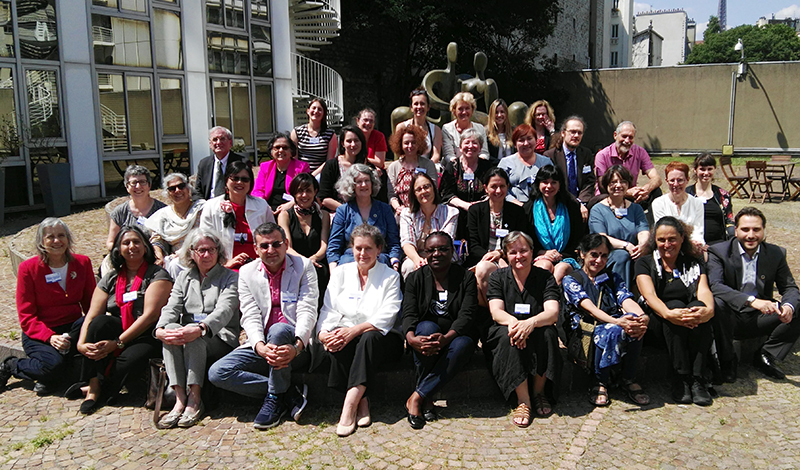 Members of the project "A Global Approach to the Gender Gap in Mathematical, Computing, and Natural Sciences: How to Measure It, How to Reduce It?" 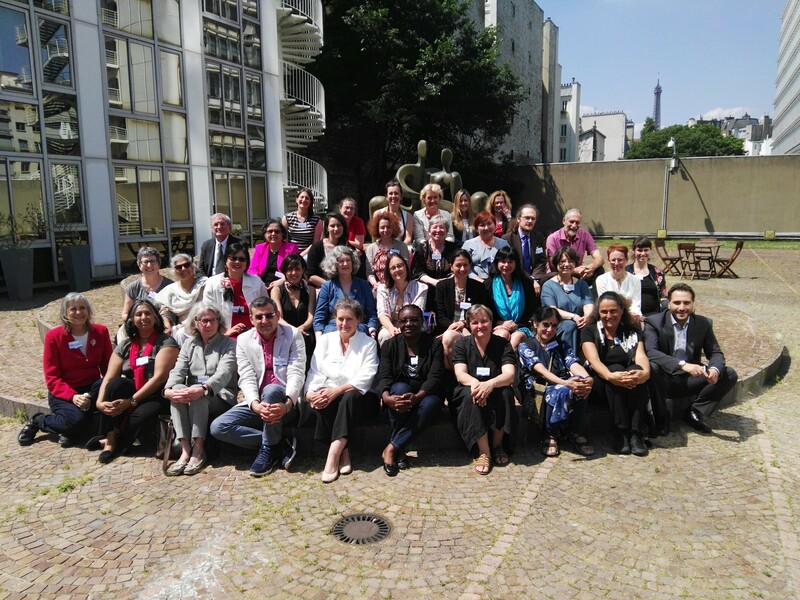 met in Paris, France, and representatives of the partner unions gathered in Paris on June 11-12 2018. They reflected on the project’s status and discussed the next steps and actions to be taken. The TROP ICSU project (Trans-disciplinary Research Oriented Pedagogy for Improving Climate Studies and Understanding) is conducting a preliminary survey to understand how topics in climate science are currently discussed in the classroom in different parts of the world. It would take approximately 8-10 minutes to complete the short survey available in several languages (English, Catalàn, Chinese, Français, Deutsch, Hindi, Italiano, Japanese, Español). The 2018 Global Survey of Mathematical, Computing, and Natural Scientists as been launched on May 1st, 2018. The survey in the project "A Global Approach to the Gender Gap in Mathematical, Computing, and Natural Sciences - How to Measure It, How to Reduce It?" will be open for answers until October 31st, 2018. You are welcome to forward this link to the survey to your colleagues, men and women. The 2018 Global Survey of Mathematical, Computing, and Natural Scientists as been launched on May 1st, 2018. The survey in the project "A Global Approach to the Gender Gap in Mathematical, Computing, and Natural Sciences - How to Measure It, How to Reduce It?" will be open for answers until December 31st 2018. You are welcome to forward this link to the survey to your colleagues, men and women. 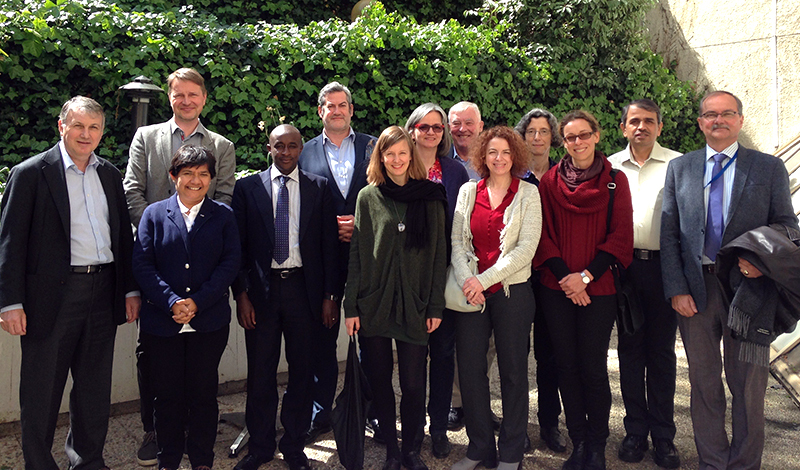 The 2nd Working Group meeting of the "Trans-disciplinary Research Oriented Pedagogy for Improving Climate Studies and Understanding (TROP-ICSU)" project took place in Paris on 25-26 April 2018. Advice/assistance in organizing pilot workshops across the world for educators on the use of the teaching toolkits. Deciding on the venue, dates and names of main organizers and the budget for the same. The project progress and roadmap was presented on the first day of ISC General Assembly on 3 July in Paris, several members of ISC, who are not yet involved in the project also attended the meeting. > Please click to see the other image. 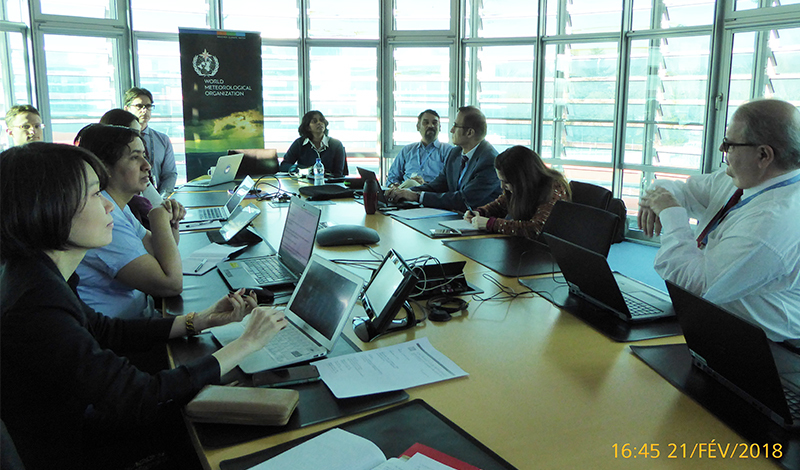 The team of the "Trans-disciplinary Research Oriented Pedagogy for Improving Climate Studies and Understanding (TROP-ICSU)" project had a meeting with WCRP and WMO in Geneva on 21-22 February 2018. It presented the project and seeked partnership especially for the quality control of the teaching tools. 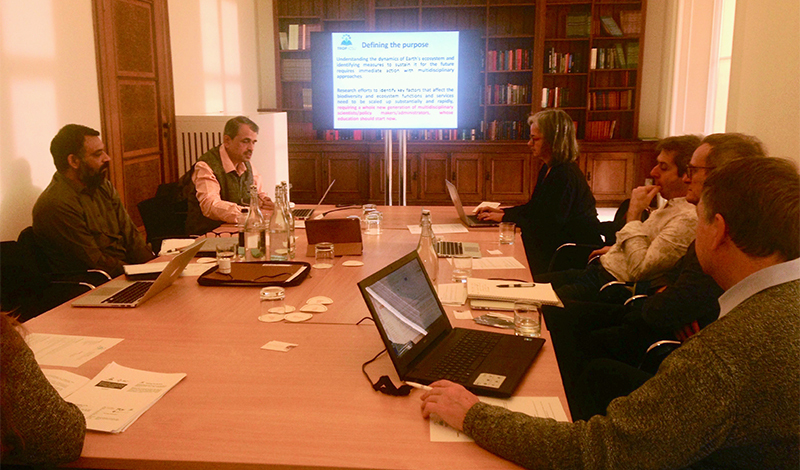 The sub-committee meeting within the "Trans-disciplinary Research Oriented Pedagogy for Improving Climate Studies and Understanding (TROP-ICSU)" project took place in London, UK, in December 2017 at the Royal Society, London. 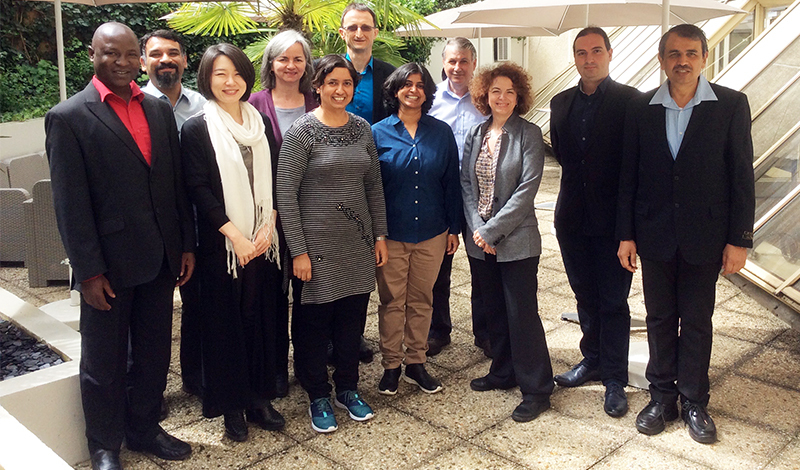 France Caron, Rahul Chopra, Marianne Cutler, Nathalie Fomproix, Chris King, Boram Lee, Sarah Pohlschneider, LS Shashidhara, Iain Stewart and Anthony Turner. We discussed design of teaching tool kits that we are developing, nature and duration of pilot workshops for educators on the use of tool-kits and changes/modifications to be made to questionnaire and ways to analyze responses. IUBS sent expert to the following workshops to discuss the project "A Global Approach to the Gender Gap in Mathematical, Computing, and Natural Sciences: How to Measure It, How to Reduce It?" and the preparation of the survey Workshop in Taipei, Taiwan, 7-8 November 2017. IUBS supported the participation of Noriko Asumi (Japan) and Tien HuynH (Australia). IUBS supported the participation of Alejandra Gonzales (Chile) in a workshop in Bogota, Colombia, 22-24 November 2017. IUBS supported the participation of Dianah Nalwanga (Uganda) and Heather Marco (South Africa) in a workshop in Cape Town, South Africa, 1-2 December 2017. About: A Global Approach to the Gender Gap in Mathematical, Computing, and Natural Sciences - How to Measure It, How to Reduce It? IUBS is one of the ten partners in the project with the title "A Global Approach to the Gender Gap in Mathematical, Computing, and Natural Sciences: How to Measure It, How to Reduce It?" Mathematical and natural sciences have long and honorable traditions of participation by highly creative women contributors. However, the percentages of women scientists remain shockingly low and there is a significant gender gap at all levels between women and men. Barriers to achievement by women persist, especially in developing countries. The project will produce sound data to support the choices of interventions that ICSU and member unions can feasibly undertake. It will provide evidence for informed decisions, including trends – since the situation for women continues to change around the world, with some negative developments – and will provide easy access to materials proven to be useful in encouraging girls and young women to study and work in these fields. Regional information about careers, jobs and salaries will be provided. The Joint global survey is planned to reach 45,000 respondents in more than 130 countries using at least 10 languages, while the Joint study on publication patterns will analyze comprehensive metadata sources corresponding to publications of more than 500,000 scientists since 1970. Contrasts and common ground across regions and cultures, less developed and highly developed countries, men and women, mathematical and natural sciences, will be highlighted. Understanding the dynamics of Earth’s ecosystem and identifying measures to sustain it for the future requires immediate action with multidisciplinary approaches. Research efforts to identify key factors that affect the biodiversity and ecosystem functions and services need to be scaled up substantially and rapidly, requiring a whole new generation of multidisciplinary scientists/policy makers/administrators, whose education should start now. Educating forthcoming generations about the causes and effects of global climate change is also imperative as implementing solutions depends on an informed public. In this context, we need to develop education and science communication modules in such a way that every future citizen would be better equipped to identify appropriate solutions for sustainable and equitable development. The project aims to identify, through a consultative mechanism, most relevant curricula and efficient pedagogical tools, and outreach and citizen science programs to study the impact of climate change on biodiversity and ecosystem function and services and human health and diseases; and ways to address these problems in the coming years. What makes the project unique is its focus on those education and citizen-science modules that are locally rooted yet globally relevant for much wider outreach. The project envisages developing online learning materials such as lectures (videos embedded with animations), interactive exhibitions/museums, mobile apps etc. Participants - Front row (from left): Jean Taylor (ICIAM), Sayara Berg (ICIAM), Danielle Gondard-Cozette (IMU), Mustafa Sozbilir IUPAC), Igle Gledhill IUPAC), Marie-Francoise Ouedraogo (IUM), Anne-Sophie Godfroy (IUHPST), Anita Rampal (IMU), Bétül Tambay (IMU), Ernesto Fernández-Polcuch (UNESCO). 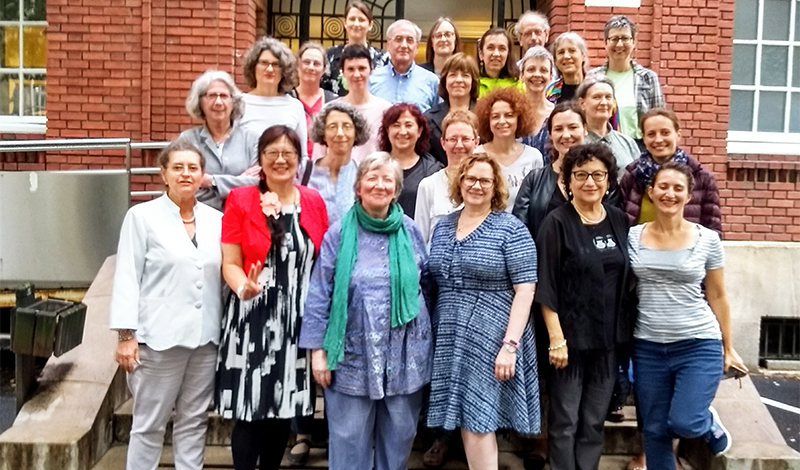 • 2nd row: Maria Esteban (ICIAM), Siujatha Ramdorai(IMU), Mei-Hung Chiu (IUPAC), Guadalupe Lozano (Expert), Anathea Brooks (UNESCO), Francesca Primas (IAU), Lucilla Spini (ICSU), Maria Rosaria Dantonio (IAU), Catherine Goldstein (Expert), Merrilyn Goos (IMU), Helena Mihaljevic-Brandt (IMU). • 3rd row: Mark Cesa (IUPAC), Alice Abreu (GenderInSite), Clémence Perronnet (Expert), Nathalie Fomproix (IUBS), Marie-Francoise Roy (IMU), Elena Bagryanskaya (IUPAC), Benedikt Loewe (IUHPST), Bill Barton (IMU). • Back row: Lucía Santamaría (Expert), Lisa Frehill (IUPAC), Silvina Ponce-Dawson (IUPAP), Tonya Blowers (OWSD), Fernanda Arraes Hertelendy (UNESCO), Rachel Ivie (IUPAP). On June 1st, 2nd and 3rd, 2017, partners of the project "A Global Approach to the Gender Gap in Mathematical, Computing, and Natural Sciences: How to Measure It, How to Reduce It?" met in Paris, France, for the first time to discuss project management and related issues. 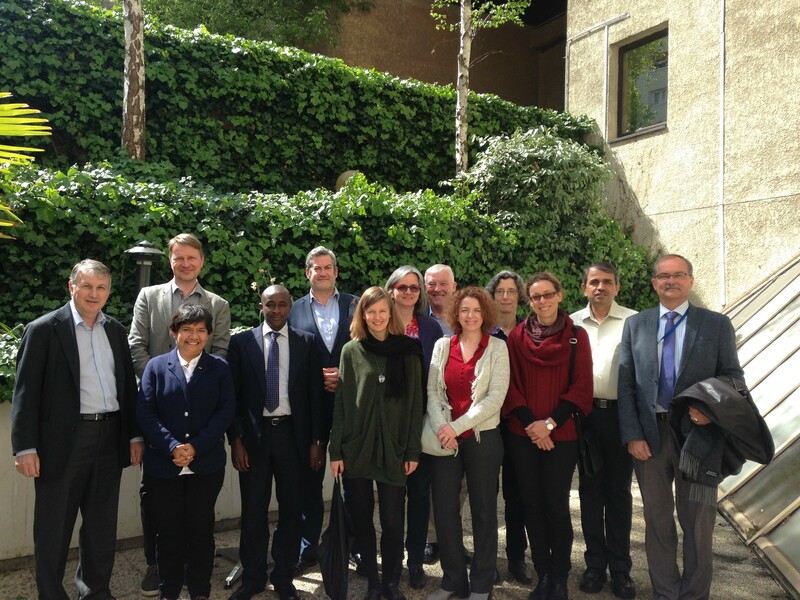 On April 20th and 21st, 2017, the partners of the project "Trans-disciplinary Research Oriented Pedagogy for Improving Climate Studies and Understanding (TROP-ICSU)" met in Paris, France, for the first time to discuss project management.